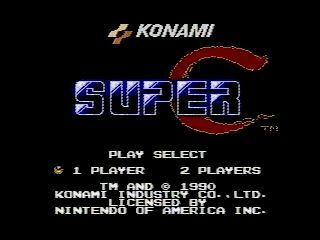 Released in April 1990, Super C added new, innovative ideas to the Contra series, like shooting aliens, shooting giant aliens, and shooting with five-way spread guns. Well, even if the game isn't very innovative, it is well known for being more difficult than Contra — there are more enemies on the screen at once, and the Konami code only gives you 10 lives instead of 30. The story features the two most heterosexual shirtless guys ever, Mad Dog and Scorpion, in a mission to kill Red Falcon. Best Time with 2 players: 0:13:08 by Kyle 'Mr. K' Halversen, David Heidman Jr. on 2013-08-11. Best Low% Time with 2 players: 0:13:36 by Kyle 'Mr. K' Halversen, David Heidman Jr. on 2013-08-21. Best Time: 0:13:16 by David Heidman Jr. on 2013-07-15. With 2 players: 0:13:08 by Kyle 'Mr. K' Halversen, David Heidman Jr.
Low% with 2 players: 0:13:36 by Kyle 'Mr. K' Halversen, David Heidman Jr.
0:13:16 by David Heidman Jr.
Shout outs to Airwe, the TASer who made the stage 8 glitch public. He might even have been the first to find it. Setting it up: Get onto the ramp that makes you go left. Go far enough so you can jump and remove the scroll lock that prevents the screen from scrolling right. Then jump off the same slope and just before you land in the pit, face left so you will bounce right. The game has to spawn you at a specific height on the screen and as far left at it can. But that said height is on the right side of the screen. When you proceed right, the screen never hits the trigger to center the screen because you spawn past it. If you compare the bottom of the screen with a normal run, you can see that it is slightly different (this run has the screen a bit higher). This causes the game to freak out once you hit the trigger for the roof to come down. I dont know why it does exactly what it does though. During this time of the glitch, YOU CANT DIE!!! If you do, you wont respawn thus soft locking the game. When the floor/roof/wall goes down, everything is cool. When it starts to go up, you have to jump or the floor/roof/wall will eat you and kill you. Once you jump once from the initial going up movement and you are not on the normal ground but on the floor/roof/wall you dont need to jump again. But once it is fully up, the red homing bubbles still spawn at the top of the screen (right on top of you). So you need to find a way to to not stop and not die to them all while dealing with random spawns. When the game "fixes" itself, if you are jumping at that moment, you have a chance of being in the roof. This makes the very end of the glitch rather tricky to survive. Once the game "fixes" itself, you will essentially have skipped a rather large chunk of that section of the game (3 sets of pits and a small portion of walking). This did not take me long to do. 2 sessions. First session I got a 13:17 on my second try, and between both sessions I got plenty of 13:18's. I quickly found out that the glitch come with issues. If you stop for any reason during the glitch or get a really bad placed spawn, you will most likely die. I had a bunch of attempts that ended during the glitch. In this run I had to stop so I took a gamble and I barely survived (play it back in slow motion and you can see just how close I was to being caught in the roof, I think if I jumped 2 frames later I would have died). I also found a few small optimizations here and there. Some make the game a bit more fun to watch. This run is still not perfect as the glitch by itself saves 3 seconds, this is only a 2 second improvement. So somewhere in the run I lost some time. But to be frank, this run is top notch anyway you wanna look at it. I think any run that is sub 13:30 is top tier. The amount of work and small things that needs to be looked at to achieve that low of a time, I commend anyone who does it. I know only a select few that have done it, and a few more that truly understand the game enough to really appreciate the classic Contra games. Yall know who you are.